COLOSSIANS 3:12 KJV "Put on therefore, as the elect of God, holy and beloved, bowels of mercies, kindness, humbleness of mind,..."
9Lie not one to another, seeing that ye have put off the old man with his deeds; 10And have put on the new man, which is renewed in knowledge after the image of him that created him: 11Where there is neither Greek nor Jew, circumcision nor uncircumcision, Barbarian, Scythian, bond nor free: but Christ is all, and in all. 12Put on therefore, as the elect of God, holy and beloved, bowels of mercies, kindness, humbleness of mind, meekness, longsuffering; 13Forbearing one another, and forgiving one another, if any man have a quarrel against any: even as Christ forgave you, so also do ye. 14And above all these things put on charity, which is the bond of perfectness. 15And let the peace of God rule in your hearts, to the which also ye are called in one body; and be ye thankful. 3:12 All who are thus renewed are elected of God, holy, and therefore the more beloved of him. Holiness is the consequence of their election, and God's superior love, of their holiness. 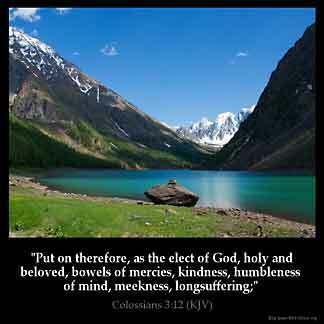 Col 3:12 Put on, therefore, as the elect of God. As a chosen, holy and beloved nation, put on these graces. Bowels of mercies. "A heart of compassion" (Revised Version). Kindness, humbleness of mind, meekness, longsuffering. These are all traits of Christ, and must be found in us if he is our life. God gave me us the ability to do this . We have Holy Spirit within to help. Our Lord does not tell us to do something that He Himself has done also. first. He trusted and loved us when we were untrustworthy and unloveable. Very hard to do. I understand the compassion part but I am human and as a human, I do have some trust issues. Because chosen by the Holy God that we must be also with compassion for His people REGARDLESS.